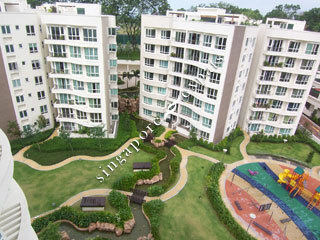 Edelweiss Park is a modern freehold residential project on Upper Changi Road North/ Flora Road. It is made up of 9 blocks each 7 and 8 storeys high, comprising 517 apartments. The property also boasts of tennis courts, exercise station, gym, clubhouse, BBQ facilities and 5 specially designed water pools with different functions. Units with roof terraces come complete with their own private spa pool. Another added provision is a shuttle bus service for Edelweiss residents, to and from the nearest MRT station. Edelweiss Park is accessible via the nearby expressways - Pan Island Expressway (PIE), Tampines Expressway (TPE) and East Coast Parkway (ECP). It takes only 5 minutes or less to commute to the Changi Airport. It takes about 5 minutes drive or take a bus ride to the nearest Pasir Ris MRT station. Nearby amenities include Loyang Point, White Sands, Tampines Mall, Century Square, The Japanese School Tanah Merah & Laguna Golf and Country Club. Efficient Generous units without wasteful planters, bay-windows and bomb shelter.